I thought that I’d show you all a few of my award winning images. 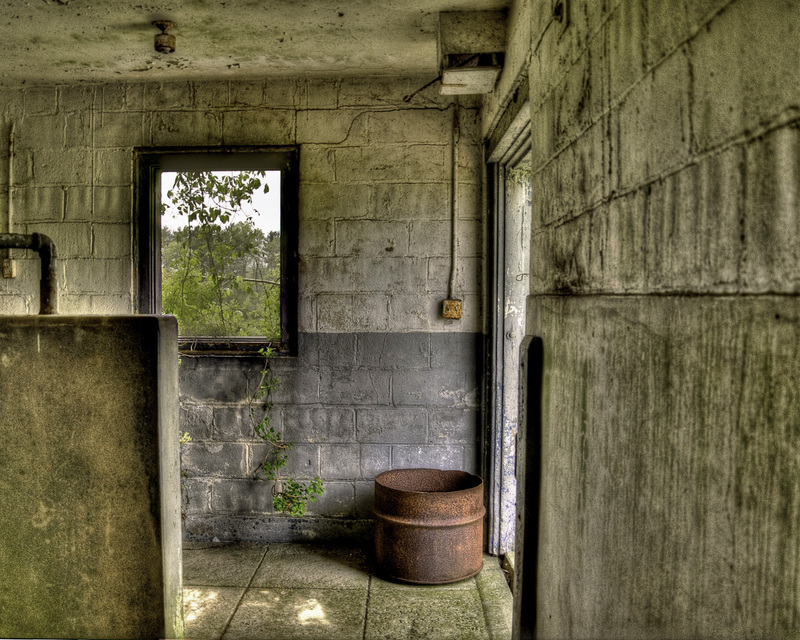 the 1st one was taken at an abandoned dairy farm in Monmouth, NJ. I actually went to this site twice and got some pretty good shots. The 2nd time I was there the Monmouth Police threw me off the site. At least they didn’t arrest me. One of the hazards of my hobby. This farm was originally tied to the Monmouth State Psychiatric Hospital, now abandoned. Sure wish I could get in to that site, but it had a guard shack and a chain link fence surrounding the complete site, but not the dairy. I won a first place with this image. It looks a little Wyethian to me, and the judge really liked it. Once again a 3 shot HDR that came out really well, although, it took me several iterations to come up with the final product. The window “burned” out th first few times and I had to reprocess at different settings. I won a first place in the non-professional catagory. The weather has been just terrible for me to go out to just shoot. So the other night I went out to specifically take some winter shots with my new camera, a Nikon D-7000. I was using a Nikon D-90 and getting some good images. So far, however, I think that this camera far surpasses the quality of image I was getting with the D-90. I have told you in the past that I love to go out near sunset to try and catch some drama. Well, in the 1st shot, I think I did that. With the sun still above the horizon giving off a nice orange tint to the clouds, and the sky a bit to the turquoise, and the clouds obscuring some of the light so there were neat rays in the sky, I’m pretty sure I got drama. The 2nd shot is a bit mundane, but with the subfreezing temps we’ve been having, these geese had no where to swim. So they were all clustered on the ice and when I came up they all got up, thinking that maybe I had some food for them. But when the expected food didn’t materialize, they all sat back down to continue their naps, or whatever. One thing I enjoy doing is running around to take pictures near sunset. No matter how often I go out the conditions are almost always different. I just really love when there are clear conditions at the Blue Hour, when the light is fading and the ultra dark blue of night is almost upon us, and there is a peachy glow low on the horizon. But many times there clouds about that really give the sky dramatic colors, and, sometimes, a sense of foreboding. Recently I was out in a lull between storms, and as the sun set I was able to grab this shot at an old farm near my house. The peaceful scene with the trees in the distance and the old fence along the driveway was accentuated by a few small clouds lit by the setting sun. This second picture was taken from a slightly different perspective, and I added a touch of artistic license to create something a bit more dramatic. In my last post I said that there were tons of bottle caps at this old distillery. So here’s an example. They were literally strewn everywhere. It was a lot of inventory to leave behind. But I guess that they couldn’t sell them to some other bottler. In my last post I said that I enjoy UrbEx, or urban exploration, photography. There are many things that really turn me on about this. In the first place, at least for me, it’s photographing old buildings. Ones that have been abandoned and left to nature to take it’s course. I have photographed within the oldest farmhouse in Cheltenham Township, in an abandoned psychiatric hospital and it’s power plant, at an abandoned dairy farm in New Jersey, and here at the abandoned Continental Distillery. There were about 13 to 15 old buildings on this site, and this was the only one open. The other buildings were warehouses used to store the product. In its last days it functioned as strictly a bottleing factory for other distillers, and produced no spirits. In its early days it distilled whiskey and bourbon mostly. All of the places I have photographed in HDR. One of these days I’ll show you that process show you have a bit of understanding about what I do. The machines behind these chairs are capping machines used to put the caps on the bottles. From what I could find looking around this kinda spooky warehouse, was that in their last days they were bottleing and capping Inver House scotch. If you look closely you can see caps littering the floor. There were, literally, thousand of caps that were left behind when the closed up the place. There are so many stories in these old places, which I love finding out. Many of you know that there are things about the hobby of mine that I really like. Like HDR (High Dynamic Range) and UrbEx (Urban Exploration) and just plain old processing. HDR requires 3 shots (-2, metered, +2) combined to pick up the full range of light (mostly) between light and shadow. I’ll give you a taste of some UrbEx later, but for now, the 1st picture is an HDR photo I took while visiting San Francisco. It was actually taken in Oakland. But, I took the image one step further to show you how I then go onto other processing to give the image a distinctive look. That’s the 2nd shot. Big Difference. tell me what you think – Really. So, Robin and I were in San Francisco visiting our Daughter and new Son-in-Law. We were walking near Fisherman’s Wharf, and Robin spotted this guy on a bench. He was engrossed in his book, and never saw this coming.